In 2012 I trained in the use of the Reciproc system. I also had the added benefit of an Endodontist for some months mentoring me in getting comfortable with the system. This system incorporates a very accurate apex locator which stops the file rotating when it reaches the end of the tooth. An added benefit for patients is that endodontic treatment can often be done in one visit instead of the traditional two. Please note your course of treatment may differ and sometimes an extra appointment may be required. Costs and pros and cons and risks for treatment will be fully explained to you prior to you committing to it. The following information is a guide to give you a basic understanding of the root canal process. Please feel free to ask me questions at your next appointment. When a tooth is damaged, the pulp (i.e., the nerve) reacts to the injury by becoming inflamed. Inflammation is characterised by increased blood pressure, swelling, redness and pain. As the pulp of the tooth is confined by the dentine anything more than mild irritation, leads to the death of the pulp. Irritation can be from many sources. Heavy biting forces over time as with bruxism can lead to the death of the tooth. Also exposed dentinal tubules from toothbrush abrasion can in time lead to the death of the pulp. Caries (tooth decay) is the most common cause of dead teeth when bacteria and their toxins invade the pulp, but also cracks in teeth can lead to irreversible pulpitis as well. Careful examination and tests confirm the diagnosis of irreversible pulpitis when the pulp in the tooth is dying or is already dead. At this point there are only two treatment options available, they are the extraction of the tooth or endodontic therapy (root canal therapy). A careful assessment will determine if the tooth can be endodontically treated as cracks, root fractures and very extensive caries can make the tooth unrestorable. If the tooth is lost, it can often be replaced with a bridge or implant. All posterior (back) teeth that are endodontically treated should be protected with a crown. The aim of endodontic treatment is to remove all the infected material from the pulp chamber and root canal system and fill the root canal system with an inert filling material. Effectively this creates a clean wound at the end of the roots where the blood supply in the bone around the tooth can effect healing. This is a simple concept but in reality can be difficult and challenging. Even so endodontics has a success rate of about 95%. Often the first step is to replace the filling in the tooth, removing the decay and placing a restoration that seals the tooth stopping re-infection by bacteria. A pre-treatment x-ray is often taken at this time. The tooth is isolated by placing a rubber dam over the tooth that forms a sealed barrier between the mouth and the tooth being treated. For those with a latex allergy, there is vinyl dam material available. The pulp chamber is accessed from the top of the tooth so that instruments can be used to clean and shape the canal system in addition to frequent irrigation. It can sometimes be very difficult to find and negotiate all the canals in a tooth, in recent years there have been many advances in endodontics. We now have nickel-titanium files and new filling materials. By far the most important advancement in endodontics today is the use of operating microscopes. 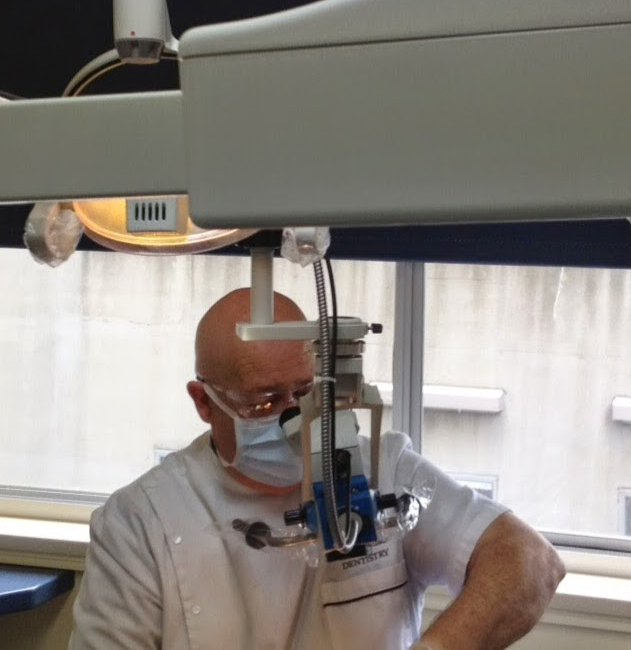 Virtually all endodontic specialists use an operating microscope when performing root canal therapy. At my practice both surgeries have an operating microscope. I have been using an operating microscope for most dental procedures since the year 2000. In the past two appointments were necessary for the root canal procedure, at the first treatment appointment the canals were shaped and cleaned and disinfected and an x-ray taken to establish the correct length. The tooth was then dressed with a cortico-steriod antibiotic paste and sealed to prevent reinfection. After a week or two, the procedure was repeated, and if the canals were clean and the tooth had been symptomless, then the root filling was placed, checking with an x-ray that the filling goes to the end of the root. Posterior teeth that have been root filled are often weak and heavily restored and they require protection. Protection usually consists of a carbon fibre post and Glass Ionomer or composite core material covered by a crown. To see how we prepare teeth please go to the Crown and Bridge page. The copyright for the above article is owned by Dr.R.D Skinner. Suite 2 on the 9th Floor. General, Implant & Cosmetic Dentistry in the heart of the City of Melbourne. We look forward to meeting you and discussing your treatment needs and options. Dentist on Collins is a dental practice located in the City of Melbourne CBD, Australia.